The title of this post is the same as that of this article on Peer2Peer Finance News. Zopa is supporting a ‘super-complaint’ against the Competition and Markets Authority (CMA) which aims to stop loyal bank customers from being overcharged. This may seem a bit cynical on Zopa’s part, but I’ve been with them for eleven years and have always got a better return after tax and any losses, than I would have got from say a cash ISA or one of the Big Banks’ Savings Accounts. Read the article and see what you think! Intriguingly, I’ve never heard a licenced Financial Adviser recommend Zopa. Will TSB Exist In A Couple Of Months? I am seventy and I have been programming computers and using them since I was eighteen. I also worked for Lloyds Bank in the 1970s, although not on their computing side, but as a high level consultant, where I was using data extracted from the main computer system to calculate bank costs, through a program I had written that was effectively a giant spreadsheet. So I have heard a lot of stories from the 1960s, of when banks were first computerised, over drinks with bank e,employees. One was about an absolutely brilliant fraud, that would make a good film. None were as horrific as what TSB have inflicted on their customers over the last few weeks. I like to check my bank account every morning, as in my view, that is the best way to pick up any fraud. So if I had been a TSB customer, I would already have long ago moved my account. It would be in everybody’s interest, if all TSB account holders moved to other banks. As that would hopefully, close TSB! This would surely mean, all banks and other financial institutions made sure they got their computing right. From my computing knowledge, I do wonder whether the TSB problems are being caused by an evil programmer! The chaos undoubtedly, could have been created deliberately. There is always a rogue state or organisation, wanting to create mischief. Banco Sabadell, who are TSB’s parent, are a publicly-quoted company. Their share price appears to have been falling recently. Could someone have placed a big bet on the share price? Chaos is a good smokescreen for fraud. Hopefully, the truth will come out in the end! By Legend, the Queen never carries any cash. I’m now deliberately following a similar policy, but I only use a contactless bank card for most of my daily purchases, like my paper and food. I’ve even still got a couple of John Lewis vouchers gathering dust in my wallet, as sincve the new M & S Food opened in Dalston, I rarely go need a Waitrose. One thing I find with M & S Food, is that on a typical purchase the average price is two pounds per item. So to keep under the thirty pound contactless limit, I rarely buy more than fourteen items. These unusually fit easily into usable bag. Buying my paper in M & S or a station also means I can use contactless for the purchase. I still use cash for three purposes. Restaurants with waiter/waitress service, so the tips go to the staff. It also means at busy times, in cafes I use a lot, I always get a table. Black cabs, when I occasionally use one. Personal services from local tradesmen, where the value is small. Otherwise it’s a bank transfer. But it’s amazing, how little cash you now need. This is a TSB advertising slogan and it looks like many of their customers will be doing this, after the fiasco of changing computers, reported in this article on the BBC, which is entitled TSB Online Banking Chaos Continues Despite Apology. I would have left TSB immediately they were taken over by a Spanish bank, as keeping your banking details on a foreign server, exposes them to a whole new set of risks. One of our mistakes in 2008 was to rescue banks, rather than let them go bust! Retail customers up to the savings limit should be compensated, but for everything else, that’s business! This article on the BBC is entitled Santander Rescues Rival Banco Popular From Collapse. One of the things, I was told by my friend, who rose to be Business Banking Director of a major Clearing Bank, was to never bank with a bank, that was headquartered and/or owned outside the UK. I would change that to England after Royal Bank of UK Taxpayers and Bank of Scotland. So who will eventually pay for Santander’s purchase? Incidentally, with Qatar’s problems at the moment and their stake in Barclays, I personally will be staying clear of that bank. This is the title of an article in The Sunday Times. It talks about an App called Blackshades, that can be bought for three hundred pounds, that enables a thief to seize control of a victim’s computer and steal their passwords. Hopefully, I’m protected but it’s a frightening concept. My passwords aren’t stored on the computer, but in my Mark 1, 1947-vintage core store, which is the safest place for them. It also says that infiltrating a smart-phone or tablet can be easier than targetting desktops, saying that many criminals set up malicious hotspots in public places. For that reason, I only use wi-fi in trusted locations and usually have it switched off on my smart phone. I never use wi-fi that wants my e-mail address as giving it usually ensures, I’ll get marketing e-mails, which I class as spam. I also check my bank account and credit cards every day or so, so that if I’m robbed, I know it first. From what I can ascertain, I think that contactless payments are pretty safe, especially in London, where there are billions of transactions because of public transport. So I use contctless wherever I can locally! 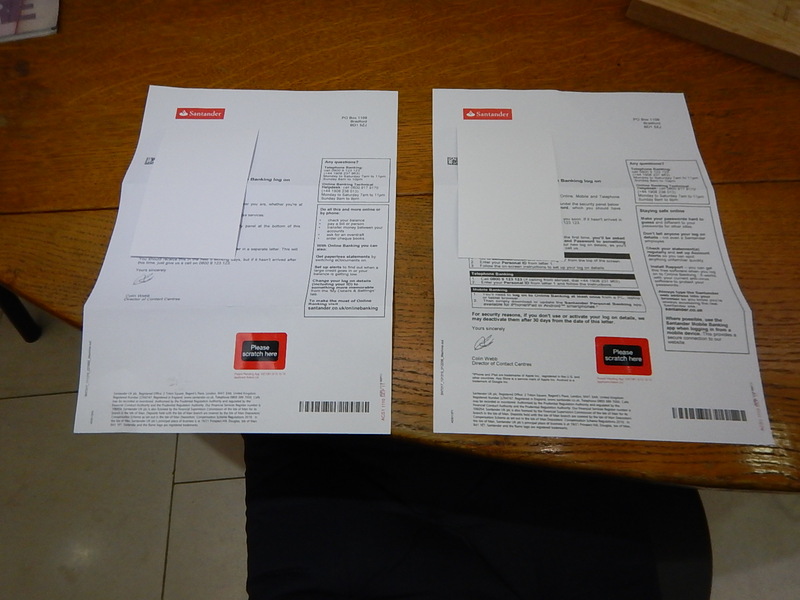 Yesterday and today, I received two letters from Santander, correctly addressed to someone I’d never heard of at my address. I should say, that I get a lot of junk mail addressed to previous tenants and I’d never seen the name before. These are the two letters. I suspect that if I’d been dishonest, I could have got access to their money, so they are now safely in a letter to Santander. I have other reasons for not banking with Santander, like the fact that I will not bank with an organisation, that is not domiciled in the UK and preferably England. But after this, I wouldn’t trust them to keep a brass farthing safe! I think what is more important here, is that surely a bank would check you lived at the address you gave. Or at least had permission to collect mail from there! Because I had a couple of my cards cloned, if I’m at home, I usually check them every morning. As someone, who made millions by writing good reports for computer users, only one of my cards and banks has a proper reporting system, that you can use however you want. And that is American Express! For a start, when you look at recent transactions, they are shown by default on AMEX with the last transaction first. However all my other cards and statements are shown with the most recent last. So as one card is used a lot for small transactions, I have to scroll down to the bottom to check the transactions. Also on AMEX, you can change the order to what you want, so perhaps if you want to locate a transaction at say Virgin Trains, you can put the descriptions in order and then scroll to V.
Why do Banks and Credit Csrd companies treat us with such contempt? Some are a total disgrace! If AMEX can do it, why can’t the others? Because they don’t care about customers! So if you’re thinking about changing your bank, make sure you have a run through the reporting of the new bank first. In my experience most are total crap! My Google Alert for Zopa picked up this article from Yahoo, who got it from the Telegraph. The title of this post and the Yahoo article says it all. If pension pots end up in Zopa and the other sound peer-to-peer lenders, just what is this going to do for banks, as it will probably mean that all the decent personal loan business in their hands will go to the peer-to-peer lenders. I wouldn’t think bank shares look to be a good long term investment. The growth of Zopa might have an interesting side effect. Imagine a group of friends having a quiet drink in a pub and one of their number turns up in a shiny new car. On discussing the purchase, the buyer reveals they bought it with a Zopa loan, that they got at a good rate, because they have a good credit rating. So will their jealous friends, decide to do something about their dodgy finance, so they too, can have a decent set of wheels. Peer pressure can work in mysterious ways. If it does encourage people to clean up their finances, Zopa will have achieved something, that financial commentators and politicians have been trying to do for years! I think too, that Zopa, which has just lent its billionth pound, is now getting too big for politicians to stop or even nationalise. Which probably means that money in Zopa is even more secure.